We have a fun toy to talk about today — Twozies! The Twozies have lost their Pet Friends. Now they need your help to come together again! Find and match the babies with their pet friends and display them in their cute shadow boxes. At first, I thought these toys were TWINS, but it’s really more about the babies and their pets. Caleb is DESPERATE to get a new pet (even though we have a dog… HELLO), so this was the perfect toy for him. 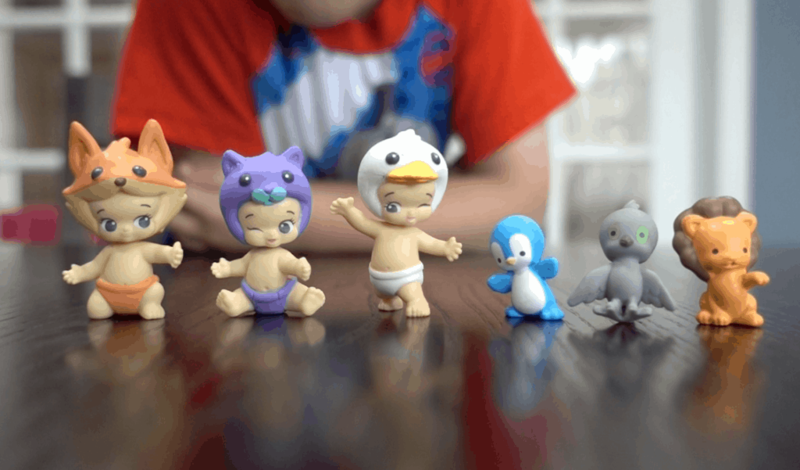 He had so much fun mixing and matching the babies and their long-lost animals. There are over 140 Twozies toys who need your help to be matched. They even have this “unboxing” mentality because some of the pieces come in blind bags which you KNOW kids love thanks to YouTube. Click here to check out some options online. Priced to sell. Oh my what cute toys these are. I would love to have them sitting on my desk to enjoy.